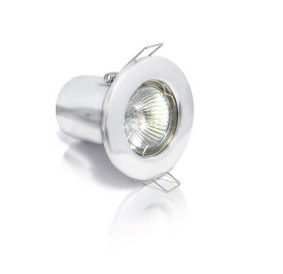 FireProof, Energy Efficient Fixed Downlights. The FireProof downlight is a stylish, energy efficient, and fire safe lighting option that saves 30% on your lighting power costs and reduces heating costs. With the benefit of insulating within 10mm of your downlights, it maximises your insulation cover, which significantly increases the energy efficiency of your ceiling space. The FireProof downlight includes an Osram low powered globe, which reduces energy consumption, and has a 5000 hour long life capability. The FireProof downlight gives off a natural warm light with all the modern lighting effects of a standard downlight, unlike fluorescent lights which give off an un-natural white light and are unable to dim. The FireProof downlight is available in a range of finishes and styles to suit any home. The FireProof downlight is a compact design that will fit into any flat roof sections, unlike many other energy efficient and fire safe downlight covers on the market. Maximises insulation coverage, reducing heating and cooling loss and saves you money on heating/cooling bills. Low powered globe with reduced energy consumption, saving on lighting power costs. The fire safe design incorporates a fire and acoustic barrier meeting the requirements of acoustic and fire ratings BS476 parts 21 and 23. Supports modern lighting effect such as dimming and gives off a warm natural ambience. Is available in a range of finishes to suit your home.